Now we're going to using keepalived to contruct a highly-available VS/NAT web cluster with two load balancers and three web servers. The topology is illustrated in the following figure. 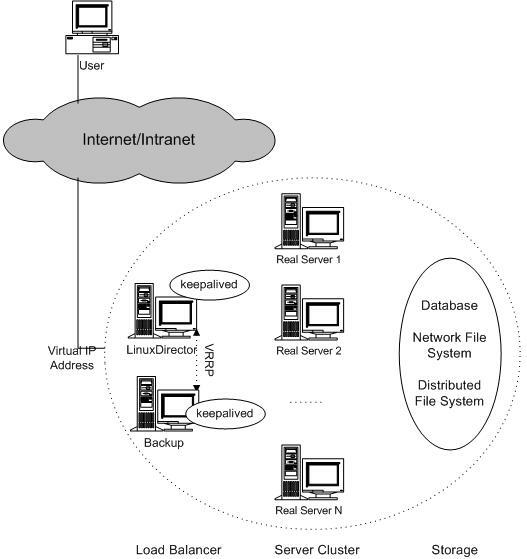 In the example, virtual IP address and gateway IP address are 10.23.8.80 and 172.18.1.254, which are floating between the two load balancers (LD1 and LD2), and the ip addresses of three real servers are 172.18.1.11, 172.18.1.12 and 172.18.1.13 respectively. The Keepalived configuration file at LD2 is similar to that of LD1, except to change the state of VI_1 and VI_2 from MASTER to BACKUP.